Forests are the most productive, self-sustaining, terrestrial ecosystems on Earth. They also require little maintenance once established. Our Food Forests Initiative (launched in 2017) establishes natural systems to provide a long-term supply of food, biodiversity and nature to communities. The idea is simple – Plant indigenous pioneer species close together to form canopy quickly. Follow up with fruit trees, berry bushes and perennial herbs. Lastly add legumes and vegetables. Our preferred intervention is phased over 3 years. After an initial training and planting, we go back every 6 months to check on the progress and plant out the next phase. The initiative trains and supports our community foresters meaning that we are creating employment in the townships. 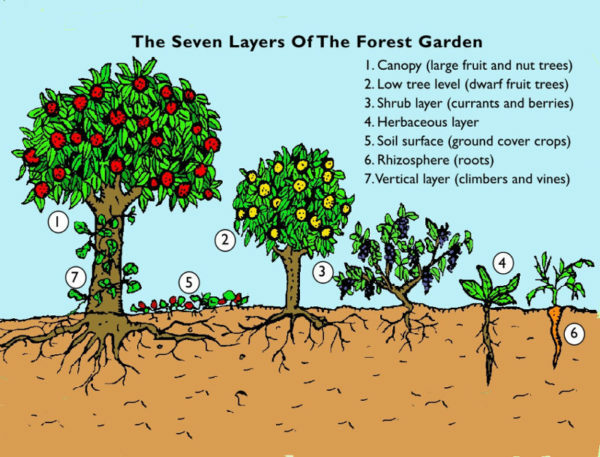 The impact of food forests is significant. They allow communities to have greater access to a wider variety of nutrient-dense foods. They also create green spaces which have been showing to have immense social and psychological benefits. We include both indigenous and fruit trees. Must be planted at pre-assessed school or assessment must be done in advance. Phases are seasonal and specific methodology is used. Good for events and team-building.